Like any parents, Mr. and Mrs. Yousafzai need the occasional night out, but they’ve had real trouble finding a nanny who is able to wrangle their Nobel laureate daughter Malala. These are the seven she’s worn out so far. Malala really got under Sister Meredith’s skin by asking if the nun had ever won a Nobel Peace Prize and acting shocked when she said she hadn’t, scoffing, “I thought everyone would have one by the time they reach your age.” She went on to ask if Sister Meredith had at least written a New York Times Bestseller or won a Grammy, and could barely conceal her laughter upon learning that Sister Meredith hadn’t even founded a school for refugees despite being 30 years Malala’s senior. Malala wanted to stay up to watch Patrick Swayze in Ghost, but Judy had been told her bedtime was 11 p.m. sharp, so Judy turned off the TV before the grand finale. This made Malala tweet out a photo of Judy’s car with a caption saying, “My new car! !” before telling Judy, “Just so you know, the Taliban thinks your car is mine now, so you might want keep an eye out because those guys really hate me and have a ton of free time.” Judy’s on anxiety medication now and hasn’t driven her car in two years. Grace’s night was actually going pretty smoothly until she went into the bathroom for a minute and Malala barricaded her in with a chair. Malala called up 40 of her friends for what she claimed was an international summit on education but was functionally just a party. Still, she sent out enough pressers to news outlets that when Grace finally broke free, she realized she couldn’t shut things down without sparking international backlash and had to clean up all the pizza and soda cans herself so Malala’s parents wouldn’t dock her pay. 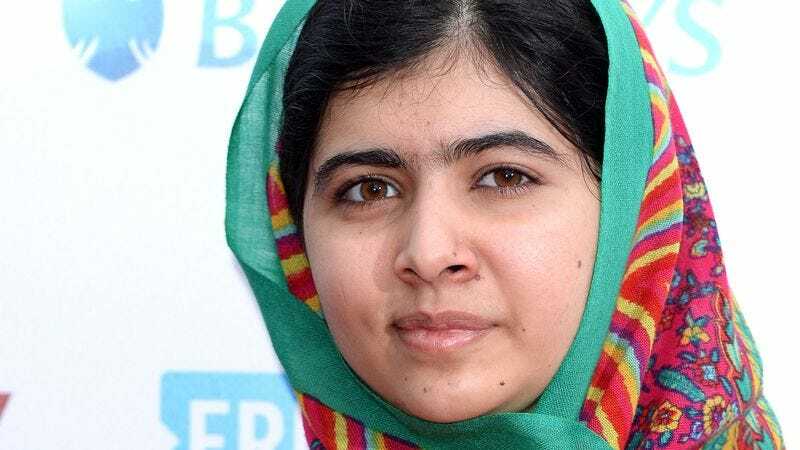 Malala’s parents hoped her co-recipient of the 2014 Nobel Peace Prize might be able to reach her on some level the other nannies hadn’t, but Malala swiped his keys to go joyriding in his Honda Civic before her parents had even left. When Simone asked Malala to turn down her music, Malala just replied, “Or what, you’re gonna shoot me in the head? Didn’t work the first time, but you’re welcome to try.” Simone had already backed off when Malala tossed her a frying pan and boasted, “Come on, I’ll give you the first swing for free. See what happens when you try to stop Malala.” Simone fled the house on foot and still hasn’t returned to pick up her bicycle.